What is a Running Bike and who can use it? A Running Bike is a three wheeled bike with no pedals which supports you as you walk or run. Running Bikes are used by people of all ages for recreation and sport at a variety of levels. A Running Bike is a very effective way of improving overall fitness, strength and well-being. Despite considerable physical challenges, most users are able to use the Running Bike to propel themselves considerably faster than they can unassisted. 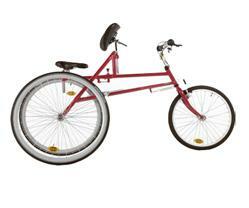 The bike can be used by children from 3-4 years through to adulthood. It is predominantly suitable for those with Cerebral Palsy, although it is also suitable for those with Muscular Dystrophy, Parkinsons Disease and other disabilities that affect mobility and balance. The low centre of gravity and frame design offers good stability and poise whilst running or walking. The saddle unit counter-acts lateral sway and also can be used as a seat when resting. The Running Bike rolls so freely that even children and adults who have been restricted to power wheelchairs have now found a way propelling themselves by their own efforts.